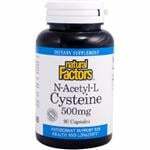 Natural Factors N-Acetyl-L-Cysteine (NAC) 500 mg capsules contain a highly stable form of cysteine, an important and diverse amino acid. NAC makes up Glutathione, a critical antioxidant scientifically proven to scavenge free radicals. NAC has the unique ability to maintain healthy lung tissue, support the body's natural defenses and enhance cellular health and longevity. These qualities make NAC especially beneficial for active people, the elderly and those exposed to polluted environments. 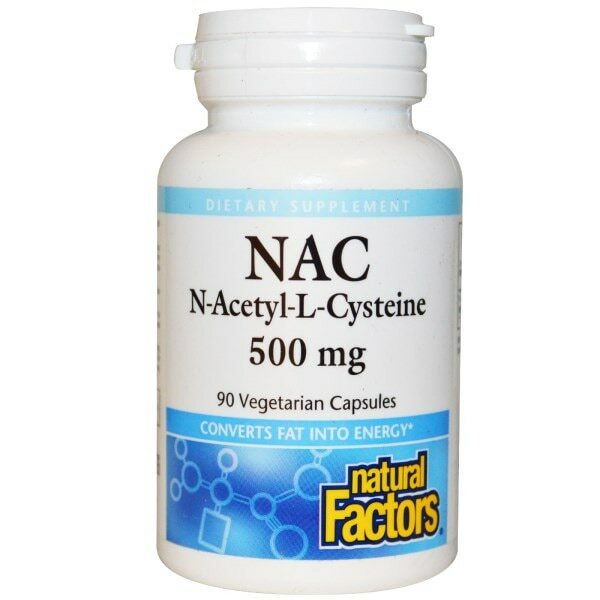 NAC (N-Acetyl-L-Cysteine) is a highly stable form of cysteine that provides antioxidant support and is especially beneficial for active people, the elderly and those exposed to polluted environments. Natural Factors amino acids are the highest quality pharmaceutical grade products available. Manufactured by Natural Factors to ensure safety and potency in accordance with the Good Manufacturing Practices (GMP), of the FDA and Health Canada. 1 capsule, 2-3 times per day or as directed by a health professional. Rice powder, vegetarian capsule (carbohydrate gum [cellulose], purified water), magnesium stearate (vegetable grade). Contains no artificial preservatives, color or sweeteners; no corn, dairy, gluten, soy, starch, wheat or yeast. Suitable for vegetarians. Although NAC's active sulfur is beneficial, some people sensitive to the sulfur may experience stomach irritation.